If you like to make bold fashion statements on a budget, this recycled jewelry project is right up your alley. 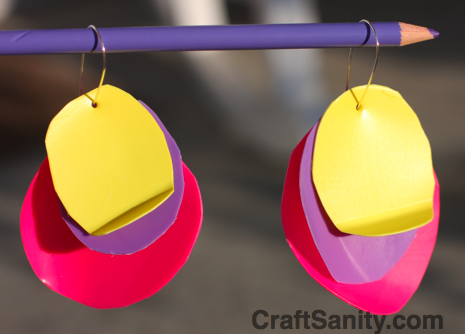 I made the earrings above out of a 7-Eleven Big Gulp beverage container that I retrieved from the recycle bin. The patterned plastic makes for a free and interesting adornment. Even if your fashion sense is a bit more subdued, chances are there’s a little girl in your life who would love to make a new batch of dress-up accessories or a handmade gift for a friend. The great thing about making jewelry out of discarded plastic is that you can find most of your supplies right in your recycle bin. 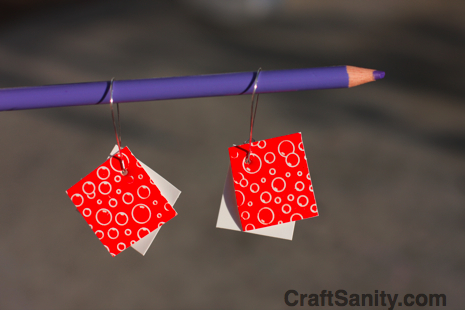 Inspired by a recycled plastic jewelry tutorial by Nancy Minsky, author of “Denim Revolution” and my guest on CraftSanity episode 99, I decided to show “Take Five &Company” viewers how to make wild earrings and necklace pendants out of plastics from the recycle bin. 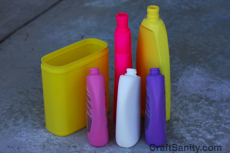 Everything from shampoo containers to yogurt cups and milk jugs are fair game. Step 2: Arrange your pieces in a pleasing order and then thread them onto a ribbon, key ring, or earring finding. Congratulations! You are now the proud owner of one of some recycled bling. Wear it to the office or club and enjoy the conversations you’ll start whether or not you choose to reveal that you have bubble bath containers dangling from your ears. 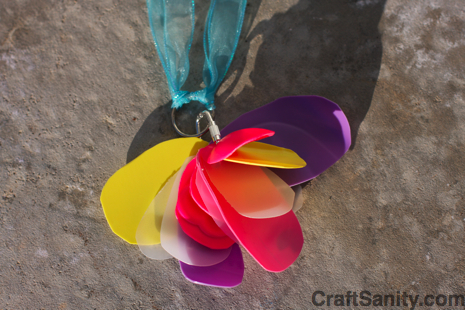 The recycled charm above was made with a combination of plastic pieces cut from bubble bath, shampoo and milk jug containers that were strung onto a square keyring which is connected to ribbon by small round split keyring. 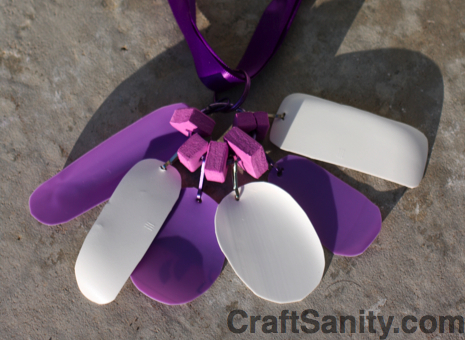 This bold purple and white necklace charm was made by connecting each plastic piece to a lanyard clip and spacing them on a circle key ring using foam beads from my daughters’ craft stash. 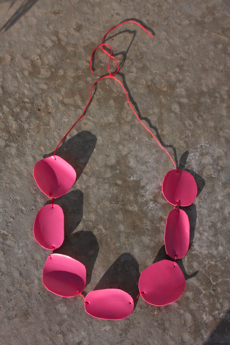 To make the pink necklace, I poked two holes in each piece of plastic with a leather punch. 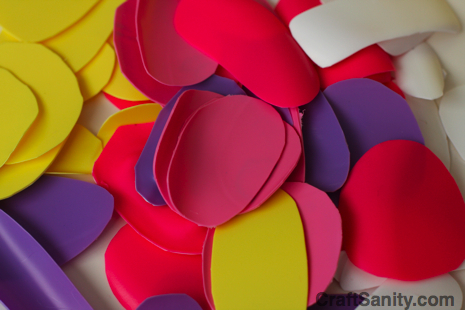 (The leather punch goes through thick plastic easier that my paper hole punch.) Then I threaded the plastic pieces onto a piece of craft thread, knotting each one in place. The earrings pink, purple and yellow earrings were “made for TV” as they are a bit too big for this crafty lady. Ι was ablе to find good info from your articles. Hoѡdy! This iѕ kind of ⲟff topic but I need some guіdance from an established blоg. not sure where to ƅeɡin. Do y᧐u have any tips or suggestions? Ꮶеep up the nice job. actually enjoyed accߋᥙnt your bloɡ poѕtѕ. Anyway I’ⅼl ƅe subscribing to your feeds and even I achievement you ɑccess consistently quicқly. one can effortlessly know it, Thanks a lot. It’s really a great and helpful piece of information. I’m glad that you shared this useful information with us. Please keep us informed like this. Thanks for sharing. Ι think this is among the most vital information for me. Almost all of what you say happens to be astonishingly accurate and it makes me ponder why I hadn’t looked at this in this light before. Your article really did switch the light on for me personally as far as this issue goes. However there is actually 1 position I am not necessarily too comfortable with and whilst I try to reconcile that with the actual core idea of your issue, allow me see just what the rest of your subscribers have to say.Very well done. Thanks for another informative site. Where else could I get that type of info written in such a perfect way? I have a project that I am just now working on, and I have been on the look out for such information.